Front (L-R) Michelle Hitzeman, DHHL; Happy Kaleikini, Ruby Emnase, Irma; Kuʻuwehi Hiraishi, DHHL; Rep. Lynn DeCoite; Back (L-R) John Comstock, Contractor; and Gene Ross Davis, Molokaʻi Hawaiian Homes Commissioner. 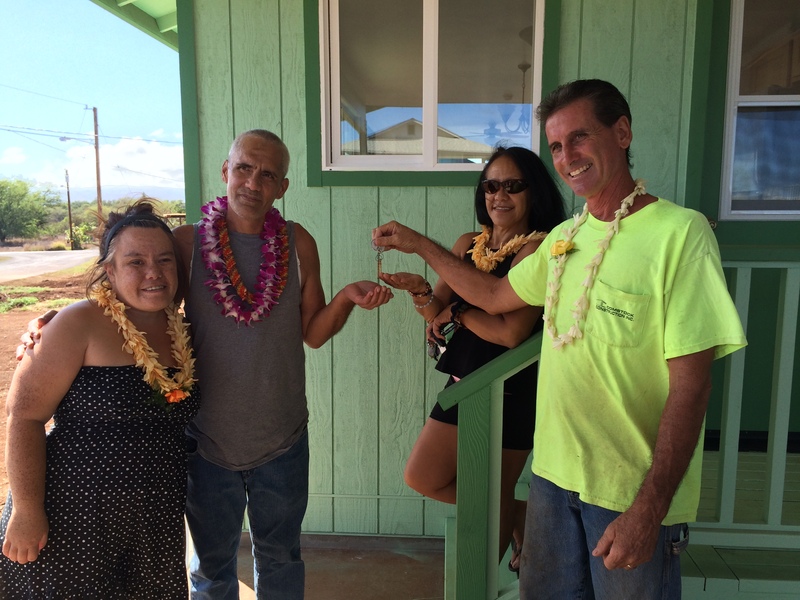 Contractor, John Comstock of Comstock Construction, hands over keys to Happy Kaleikini and his ʻohana. 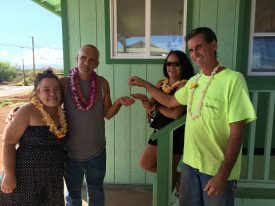 KALAMA’ULA, MOLOKA’I – The journey to homeownership for Kalama’ula’s newest homesteaders came to a close today when Happy Kaleikini and Conrad “Zuzu” Aquino received the keys to their new Moloka’i home. Happy Kaleikini, 53, originally received his homestead lease in 1985, but was unable to afford the cost of construction at the time. As a result the lot remained vacant for decades. Happy, his wife Irma and their daughter Ruby Emnase lived on the mainland for 20 years to seek better employment opportunities in hopes of someday returning home. 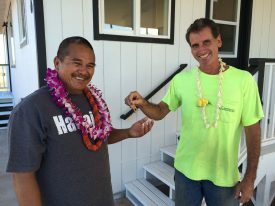 After 10 years living in a tent in Wailau, Zuzu received the keys to his new 2-bedroom, 2-bathroom home! Conrad “Zuzu” Aquino, 58, spent the last 10 years living in a tent in Moloka’i’s remote north shore valley of Wailau. While Zuzu was content spending his days fishing and living off the land, this opportunity to build a homebase for himself and live closer to his mother Leiola, sister Candy and his nieces and nephews, was one he could not say refuse. After receiving the keys to her new Package Home, Irma Kaleikini inspects her new kitchen and living room in Kalamaʻula. 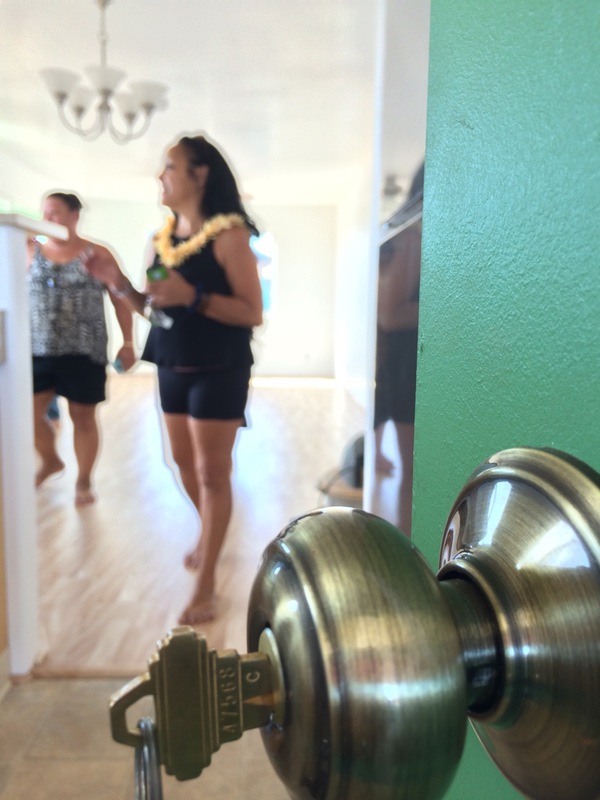 These new homes are the first in the state to be completed under the Department of Hawaiian Home Land’s Package Home Financing Program. 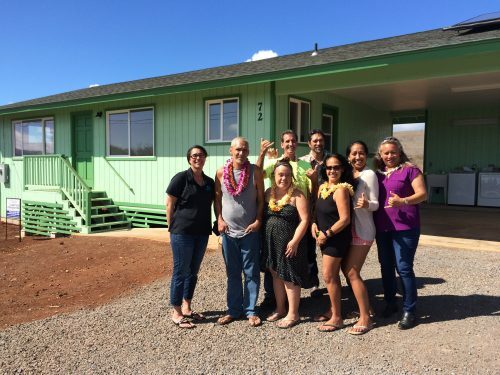 The Packaged Home program was designed to help low-income native Hawaiian families maintain their vacant homestead lot by financing the cost of packaged home materials and saving participants as much was $120,000 over the course of 30 years. Both homesteaders will be paying approximately $400 a month for their mortgage on a 2-bedroom, 2-bathroom packaged home from HPM Buildling Supply. The homes were built by local contractor Comstock Construction, Inc.